On 15th Jan. 2019, EDchatDE will take place for the 224th time. 224 times topics were chosen, questions prepared, translated, the chat moderated, in most cases André, Peter (R.) and Torsten were active, Christiane and Mandy were background support. We would like to take this opportunity to thank our colleagues who worked in the team in 2015/16 and were also involved in the creation of the #EDchatDE book (in alphabetical order): Alicia, Elke, Ines, Monika, Peter (J.) and Urs. For almost five and a half years we have shown how a chat can work. We are proud of this, but we have noticed for some time now that our calendars are getting more crowded. And when we, André and Torsten, looked through our agendas, we very quickly noticed that many of our Tuesday appointments this year are full. Especially in the next weeks we cannot moderate. The #EDchatDE on 15.01.2019 will take place as usual, apart from the topic voting at the end. 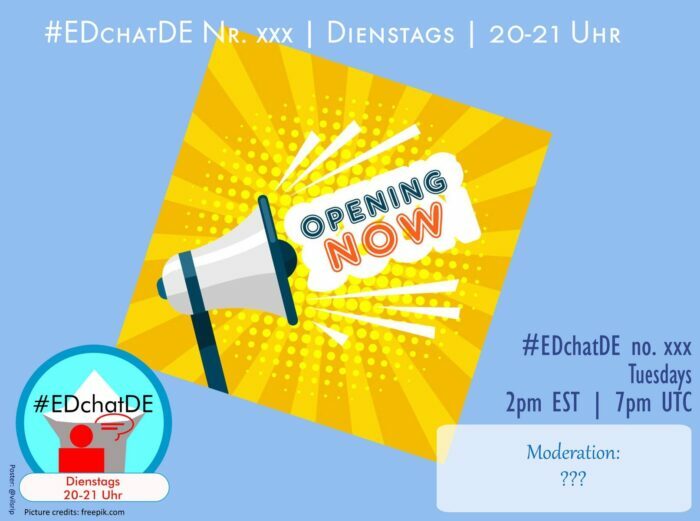 So if you want to prepare, advertise, moderate or join the 225th EDchatDE on 22.01.: The Google-Doc can be found here.